The news of the passing of dear Ravi is indeed most unexpected and shocking. “He was a familiar face in every gathering, at every event and at every occasion. It will be difficult to imagine life without Ravi not around.” With words such as these, with tears overflowing, the friends bid farewell to one so loved and so liked that it is difficult to imagine or expect another to fill the void left by dear Ravi… He truly lived his life and strived to embody the virtues and attributes extolled by the Master, `Abdu’l-Bahá’. 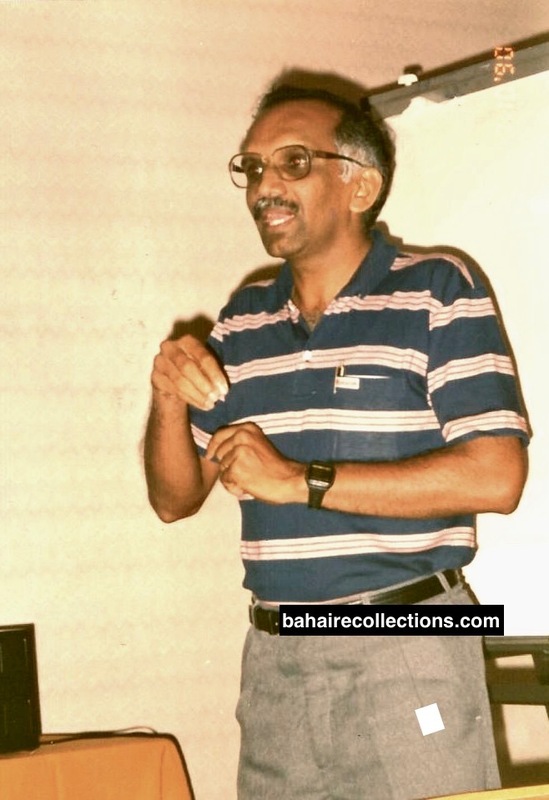 Ravichandran, affectionately called “Ravi” was one of the foremost believers of Malaysia who served with distinction from the time he accepted the Faith. Never seeking any prominence, name, fame and recognition, Ravi’s primary aim in life was to serve the Cause with the overflowing love he had for the Blessed Beauty and His Glorious Cause- till his last breath. 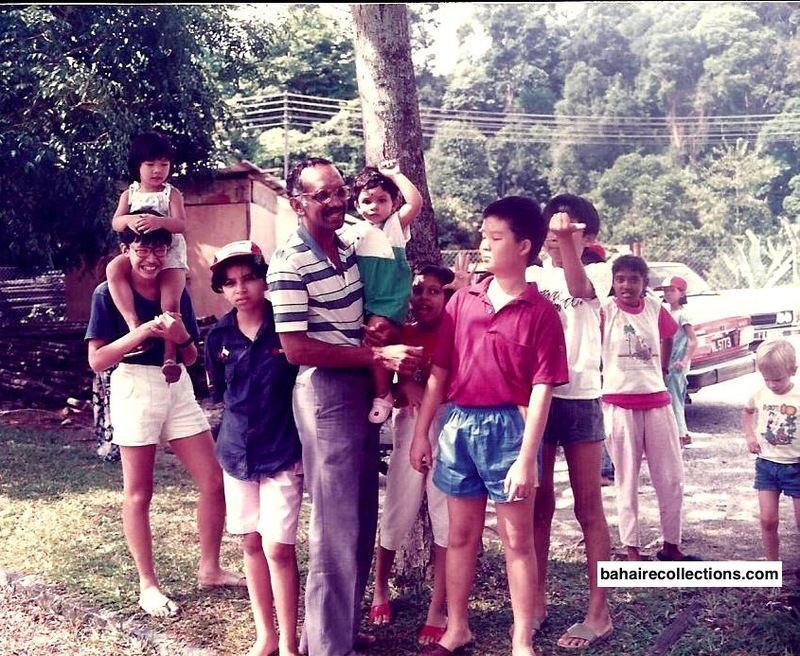 Ravi was born in Batu Gajah, Perak as the fourth child, and the only son. When the first three were girls, his mother prayed hard to be blessed with a son. Ravi was born on Sunday 21 January 1945. The mother Mrs. Nagamah was so happy that she made offerings of thanksgiving at the temple and prayed for her son to grow up as a very spiritual person. From Ravi’s childhood days the parents gave him all the exposure to Hindu rituals and trained him to be a pious Hindu. Ravi did grow up as a prayerful person. When his father Mr. Sinnathamby, an Auditor with the Malayan Railways was posted to the Railways Department in Seremban town in the state of Negeri Sembilan, the family moved there. Therefore, Ravi had his elementary education at the King George V School in Seremban from 1952 to 1957. 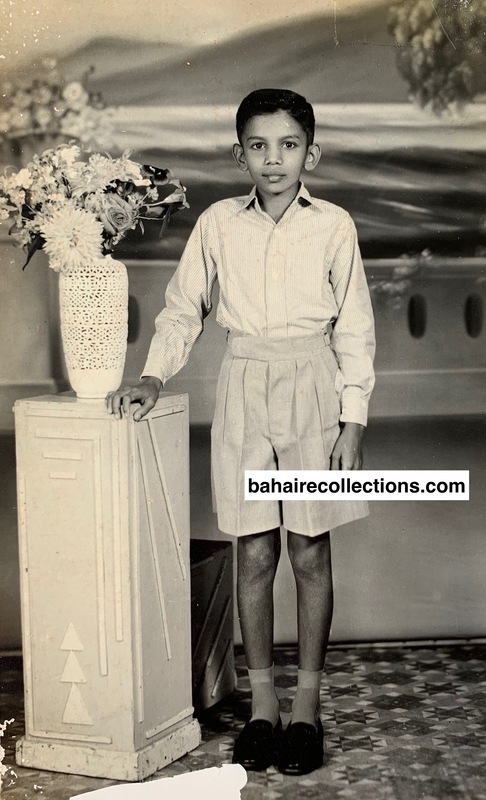 When his father moved to Ipoh on promotion as an Accountant, Ravi continued his studies at the Saint Michael High School from 1958 to 1962. He studied his form six from 1963 to 1964 in the same school and passed his Higher School Education. As a bright student Ravi was offered a career as a Technical Assistant at the Malayan Railways in Sentul, Kuala Lumpur in 1965. He demonstrated to be such a valuable worker that in 1966 the Malayan Railways offered Ravi scholarship to pursue a Diploma in Mechanical Engineering at the Technical College in Kuala Lumpur. Ravi gaining admission into the Technical College was providential as it changed his life forever and molded him into one of the greatest servants of the Cause. It was in the same year that Choo Yoke Boon from Alor Setar town in the state of Kedah had enrolled into the same College and initiated the Technical College Bahá’í Society. Choo Yoke Boon started organizing a series of firesides in his hostel room. Some prominent students had accepted the Faith at these firesides. A.P. Arumugam, President of the Technical College Hindu Society, and Jasbir Singh, Vice Chairman of the same society had accepted the Faith. Ravi was known as a devout Hindu at the college and kept away from these firesides. Teh Teik Hoe from Alor Setar who joined this college in 1967 says some students viewed Ravi as a Hindu fanatic. When Ravi heard that A. P. Arumugam, President of the Hindu Society had accepted the Bahá’í Faith, his interest in getting to know more of the Bahá’í Faith escalated. Taking keen interest in the new religion, Ravi attended a fireside where Choo Yoke Boon was the speaker. That was on Wednesday 1 March 1967. As Choo Yoke Boon started introducing the Faith, Ravi was spellbound, as the teachings and principles touched him most, and very appealing to his own life. Ravi asked a few questions to which he received the most convincing answers. As the fireside meeting was coming to a close, Choo Yoke Boon casually mentioned that the Bahá’ís the world over would be starting to fast for nineteen days effective the following day. Ravi got excited and mentioned that he too wanted to observe the fast. But Choo Yoke Boon informed Ravi that the fasting was meant for the Bahá’ís and Ravi had to accept the Faith if he wished to fast the Bahá’í way. Ravi immediately said he wanted to become a Bahá’í there and then. He signed the Bahá’í declaration card on Wednesday 1 March 1967 and started fasting the following day and completed all the nineteen days of fasting in full! That was unusual for anyone to accept the Faith and start fasting immediately. That was perhaps one of the rare cases to cite in living memory. It goes without saying that Ravi was already a convinced believer within the period of the fasting itself! As soon as Ravi accepted the Faith in 1967, he was on fire with the love for the Blessed Beauty and His Faith. He undertook a series of teaching activities. And a turn of events were instrumental in shaping the Bahá’í life and virtues of Ravi. Ravi started to be actively involved in the activities organized by the Technical College Bahá’í Society. One of the major activities that Ravi got involved even while observing the fast was an exhibition of Bahá’í books, posters, and paintings that the members of the Society organized in the college. The Society also organized a Bahá’í Exhibition and a Get-Together in August 1968 to welcome the freshmen for the academic year 1968/69. 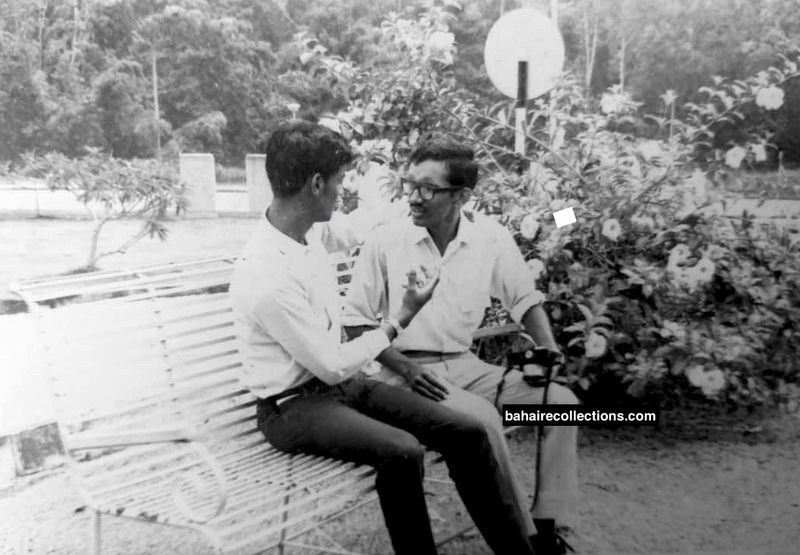 In 1968, Ravi went in the company of Leong Ho Chiew to the town of Taiping in the state of Perak to teach Dr. M.M. Sreenivasan, who accepted the Faith. 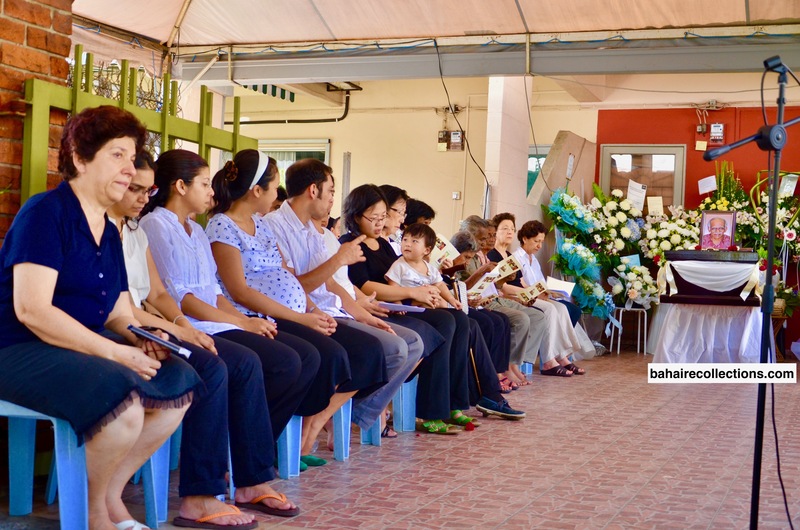 According to Ravi’s own confession, Ravi was much confirmed in the Cause through the spotless life of the late Choo Yoke Boon. Ravi was first deepened by the deepening classes organized by this group. He made several trips to the National Bahá’í Centre in Setapak, Kuala Lumpur where he met several other Bahá’ís and participated in the activities there. Ravi made it a point to attend all the conferences in Malaysia, and in later years several of the international conferences in other countries. He was a familiar face everywhere, carrying a camera wherever he went. At the time when Ravi accepted the Faith, few Bahá’í books were available. But Ravi developed tremendous appetite to read whatever was available. In those days, the National Bahá’í Centre cyclostyled many deepening materials. 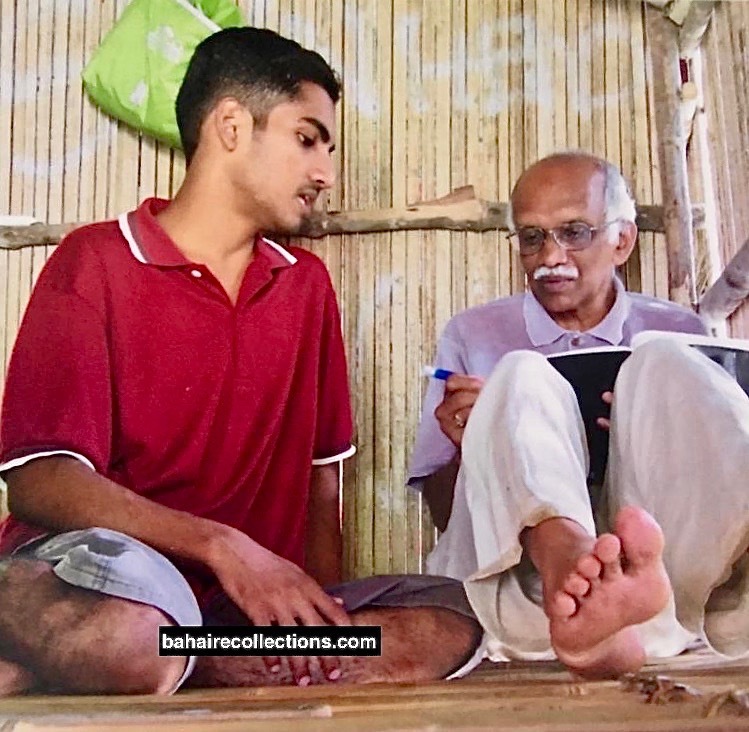 Ravi used to collect and bind the extra circulars, newsletters and reading materials, and treasured them for his personal reference and reading. He was a wide reader of Bahá’í Writings, and always shared with others what he had learnt. In 1967, Auxiliary Board Member Leong Tat Chee of Malacca community had a few printed copies of the Long Healing Prayer in English. When a copy was made available to Ravi in 1968, he wrote out a few copies, in his own handwriting, and shared with some of his friends. Within the immediate years of accepting the Faith, Ravi was well conversant with the tenets of the Faith. A major turning point in his Bahá’í life was the South East Asia Regional Conference that was held in 1967 at the MARA Auditorium in Kuala Lumpur. His soul saw a tremendous transformation from the talks delivered by Hands of the Cause of God Dr. Raḥmatu’lláh Muhájir and Mr. Abu’l-Qásim Faizi . In the following year he once again attained the presence of Mr. Faizi at the First South East Asian Regional Youth Conference held in 1968 at the Malayan Teachers College in Kuala Lumpur. It was at these conferences that Ravi saw several believers from other parts of the world coming together and consorting with each other closer than members of the same family. The talks that the Hand of the Cause of God Faizi gave at this conference moved Ravi to his very core. 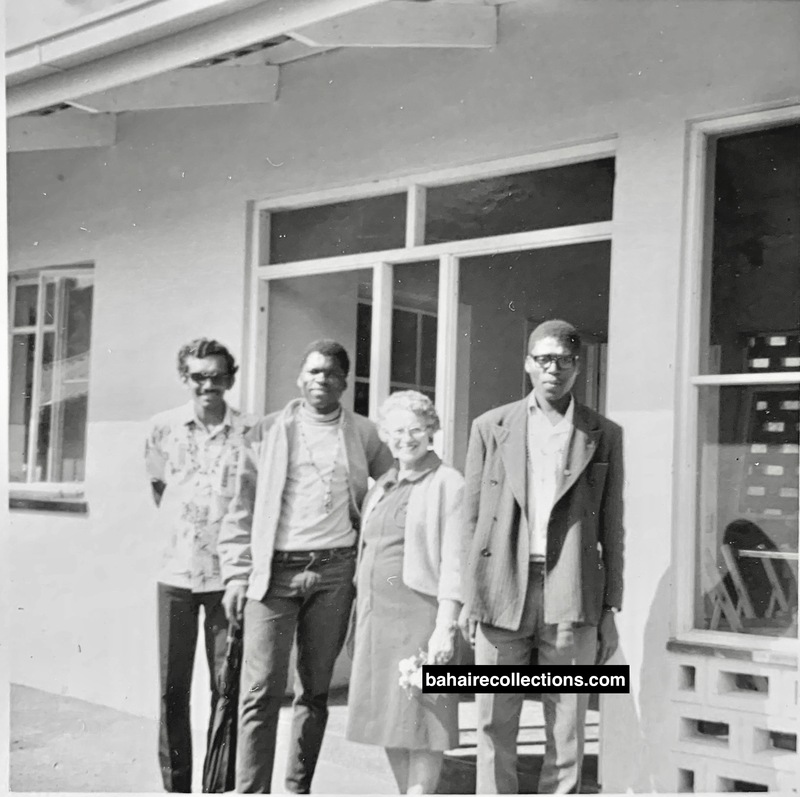 Ravi had the bounty of meeting several other Hands of the Cause of God in Malaysia such as Dr. Muhajir, Collis Featherstone, Enoch Olinga and Jalal Khazeh in whom he saw something not to be found in other human beings he moved with. Of course in his travels abroad he had met a few other Hands of the Cause of God. Their saintly life had a tremendous effect on Ravi and he developed reverence for them. Having understood the station of the Hands of the Cause of God, Ravi always humbled himself in their presence, and later in the presence of the elders in the Faith. By 1969 Ravi was invited to be speaker at Bahá’í meetings. He spoke on the subject of “Devotion” at the Bahá’í Teachers Training Course conducted in September 1969 at the National Teaching Institute in Malacca. The audience was impressed with that maiden talk of Ravi. His presentation was said to be as mild as milk, and yet had penetrating influence! The topic of “Devotion” suited his own self as that was what he himself portrayed throughout his earthly life. Ravi was also active in several national committees. In 1969 the National Spiritual Assembly of the Bahá’ís of Malaysia formed the Coordination Committee for Teaching. This committee later came to be called the National Coordinating Unit. Ravi was one of those appointed to this Unit. This Unit was to monitor closely the reports received from the Area Teaching Committees in West Malaysia and help the National Spiritual Assembly in planning and coordinating all teaching activities and activate the dormant Local Spiritual Assemblies and communities and encourage them in teaching work. In 1970 he served effectively on the National Teaching Committee. Ravi was also on the Local Spiritual Assembly of Kuala Lumpur right up to 1972 when he left the country to pioneer in Swaziland, Africa. 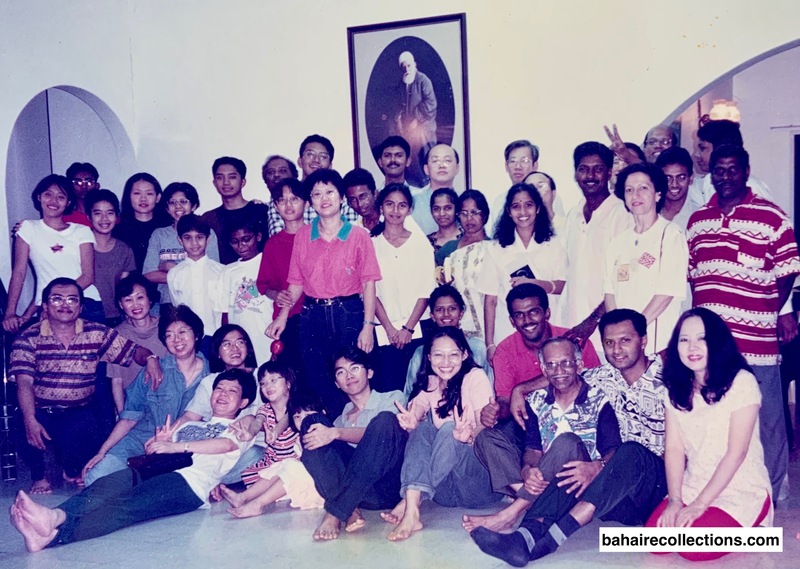 These were among the initial areas of Bahá’í service by Ravi, and his meteoric rise in the Faith thereafter is today part of the Malaysian Bahá’í history. 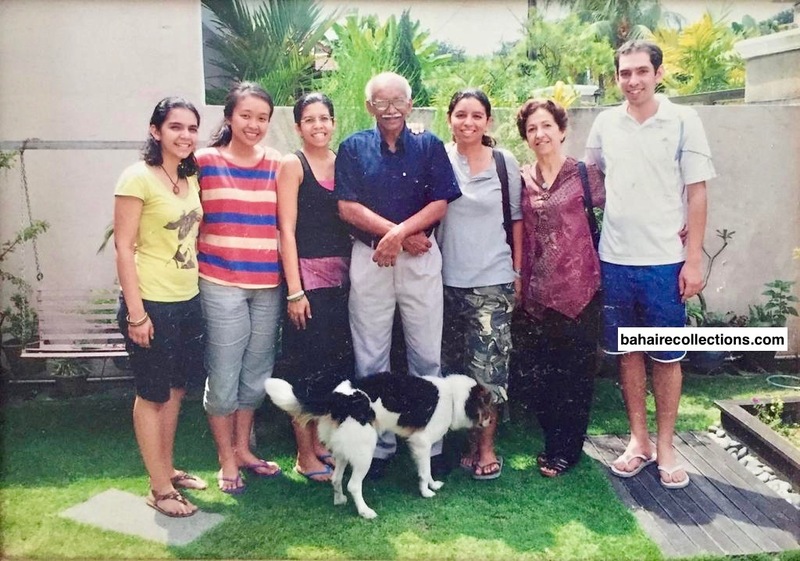 Ravi’s life story would be incomplete if no mention is made of his stay at the home of Inbum Chinniah or “Inbum” as he was referred to, in Setapak, Kuala Lumpur. Ravi graduated from the Technical College with a Higher Diploma and started working as an Engineer with the Guthrie Plantation Group. In 1969, Inbum had already moved from Jasin town in the state of Malacca to a rented house at Jalan Terkis, just behind the National Bahá’í Centre in Setapak, Kuala Lumpur. Inbum was then Secretary of the National Spiritual Assembly. In that year Ravi went to see Inbum at the National Bahá’í Centre. Inbum asked Ravi whether he had found accommodation. Ravi replied, “Not yet.” Inbum immediately invited Ravi to come and stay with him. The days Ravi basked under the guidance and love of Inbum Chinniah had a remarkable influence on Ravi. The life that Inbum led had a great impact on Ravi. Ravi was staying with Inbum’s family, following them from house to house. As Secretary of the National Spiritual Assembly, Inbum would go to the school in the morning and from there straight to the National Centre, only to return home late at night. And Ravi was there to look after the needs of Inbum’s family. Ravi was ever willing to take the children to school and fetching them back too. He used to ferry the children to tuition and piano classes. He was so much part of Inbum’s family. Inbum’s four children grew up with him. He was an uncle to them in the true sense of the word. If anything was amiss in the house, it was Ravi who put them aright, like changing a fused bulb or adjusting a leaking tap. Never did he refuse to help out, always so willing to lend a helping hand. He was such a good handyman around. Ravi was always running errands for Inbum’s family. Never did he once complain that he was busy or too tired to do things for them. At one time, Inbum had nine youths staying with them and Ravi had to share the room with three other youths. But he never grumbled or complained about any of the other younger and sometimes “immature” roommates. Quite often, when he came home for lunch, there were times the family did not have any food in the house. When Lily informed Ravi of the unavailability of food, he would reply smilingly, “Don’t worry Lily. It’s all right.” Then Lily would ask her house helper Ah Lan to fry two eggs for him. He would just eat plain rice with the fried eggs, never complaining or showing a dull face. All the years Ravi was staying at Inbum’s house the family members had not heard him criticizing anyone or backbiting or gossiping about anybody. He had only good things to say about all the friends, Bahá’ís or non-Bahá’ís. Every month, when he received his salary, he would put his share of rentals in an envelope and give it to Lily with both hands. He gave her the money as if he was presenting a gift to the Queen! He was always the first to receive his salary and he knew Lily needed money to run the house, so he would give the money to Lily as soon as he could. Inbum was truly fond of Ravi. To him, Ravi was like a brother. They would have long discourses on the Faith, among other private matters. They could talk far into the night. Inbum then became his spiritual father, friend, philosopher, and guide. He had learnt many qualities from Inbum, chief among them being humility and obedience to institutions. One day, Inbum told him, “Ravi, I have a title for you. You are now Swamiji.” Many friends called him “Ghandiji” as well as he resembled Mahatma Gandhi, leader of the Indian independence movement. All early believers simply loved Ravi for his radiance, humility, and cheerful spirit. When Ravi was studying in Kuala Lumpur there was another believer with the same name- “Ravi Upendra.” This caused confusion at Bahá’í gatherings. Whenever a believer called one Ravi, both of them responded. The believers found it necessary to give a nickname to one of them. 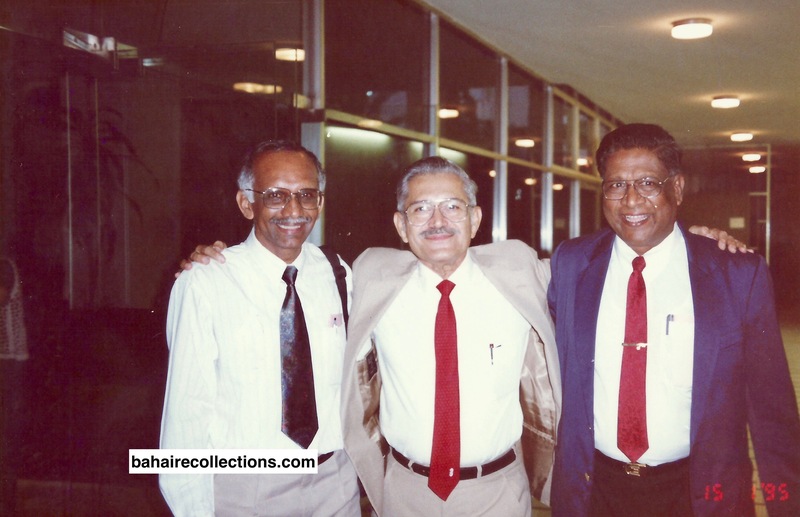 The friends selected the Ravi under discussion and decided to call him “Keretapi Ravi” meaning Railways Ravi and Ravi Upendra as “Ravi Asli.” That was because Ravi was attached to the Malayan Railways when he came to Kuala Lumpur. Ravi was only too happy to accept this nickname. With such a soft personality that was of Ravi, everyone living in Kuala Lumpur loved him. They used to poke fun at him and yet he was smiling away. Coming from Ceylonese Tamil background, he had a peculiar way of speaking in the Tamil language. Whenever Ravi met Tamil-speaking believers he would call them “Appu” in the Ceylonese style. In 1971, Mr. A. Govindasamy, Mr. Audi Singam and Ravi were staying with Inbum. Govindasamy and Audi Singam decided to present a story telling comedy along tunes of songs from Tamil films. It is called Kathakaalashebam (கதாகாலஷேபம்) in Tamil. These two friends wanted to have a third person as an enquirer asking questions in Tamil, and they went for Ravi. Ravi was sporting and consented. This comedy sketch was presented at the social evening of the National Conference in 1971. It was such an instant success, and highly hilarious. Ravi with his little colloquial Ceylonese Tamil dialogue drew so much laughter. It was so popular that the same was repeated at the National Youth Conference in December 1971. Choo Yoke Boon in introducing this presentation announced, “Friends, by popular demand a very popular sketch presented at the national convention early this year will be presented by the three musketeers Govindasamy, Audi Singam and Ravichandran.” All the three once again stole the show. Ravi, as an innocent child-hearted believer was always active and boisterous at gatherings. The small sized Ravi bought a Mini Cooper as soon as he got a job with the Guthries. Ravi used the car fully for the Cause, often transporting Bahá’ís without means of transport for Bahá’í activities and visiting isolated Bahá’ís and communities. Ravi used his Mini Cooper to ferry books from the Bahá’í Publishing Trust to a summer/winter school. There were so many books filled in the car, that the car’s suspension was damaged. Only a few believers dared travel with Ravi on long journeys, as he was a very fast driver. While Ravi was staying with Inbum’s family another turning point came about in his life. 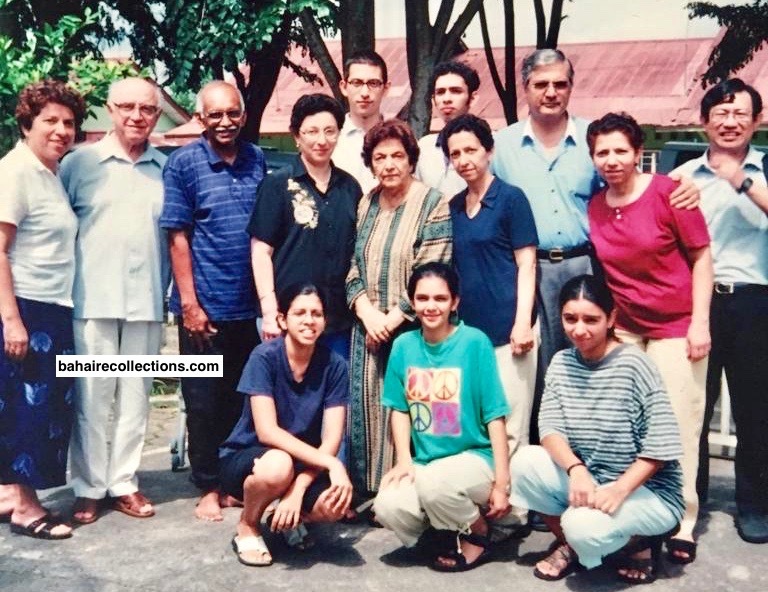 It was just in December 1968 that the Astani sisters Nargis Astani Shishvan and Nasrin Astani Shishvan came for the First South East Asian Regional Youth Conference held at Malayan Teachers College in Kuala Lumpur. 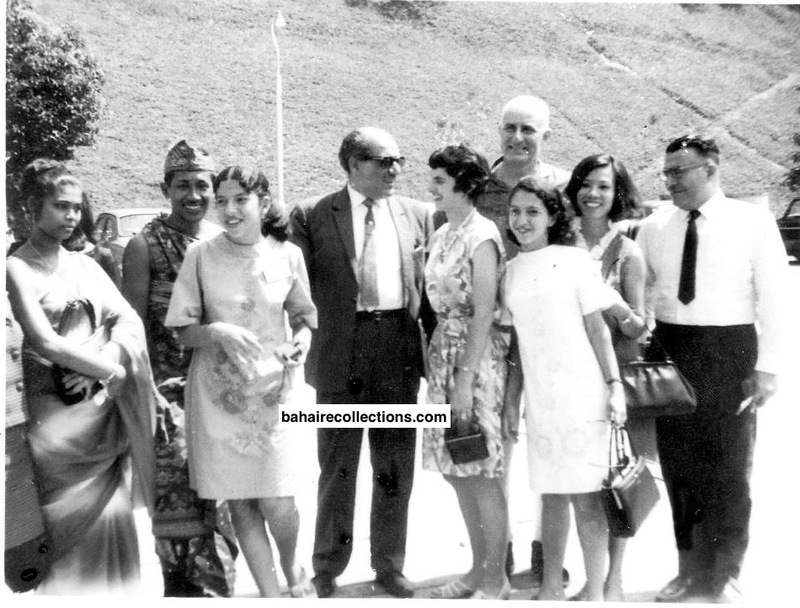 After the Conference, in 1969, Nargis and Nasrin went to Singapore for one month to help with their teaching project. Following that, they returned to Malaysia and travelled visiting communities in Johor, Malacca, Seremban, Kuala Lumpur, Ipoh, Penang, and Alor Setar. When they got back to Kuala Lumpur, they stayed few days with Inbum’s family, where they met Ravi, a very shy youth also staying in Inbum’s house. Lily gave a glance at Nargis and then at Ravi. She came up with a splendid idea. Lily pushed Ravi to take Nargis around and to the National Bahá’í Centre in Setapak for activities and for sight-seeing in Kuala Lumpur. Ravi who was so shy asked Lily, “Is it alright to take her out?” Lily candidly answered, “Of course! You have a car and if you don’t take her out, who else will?” Ravi obediently took Nargis in his car to the Bahá’í gatherings for fellowship. Lily had expected them to fall for each other some, but nothing happened this time around. Nargis and Nasrin returned to Indonesia. Next Ravi and Nargis met at the Oceanic Conference in Singapore in January 1971. Dr. Fazllolah Astani, father of Nargis came from Indonesia, her elder sister Helina and her second sister Vida came from UK. Dr. Astani was distributing free Bahá’í badges containing the Bahá’í symbol. I received two pieces. Dr. Astani happened to meet Ravi at the same Conference. This was the time Ravi and Nargis got to know each other better, but still nothing more than that. After the Oceanic Conference Ravi and Nargis started corresponding casually, still not knowing they were establishing a bond that would unite their hearts perfectly-and permanently! Photo that Ravi took at the Oceanic Conference. Standing L-R: Theresa Chee, Alan Tan, S. Satanam,Vida Astani, Collis Featherstone, Enoch Olinga, Nargis Astani and Helina Astani. 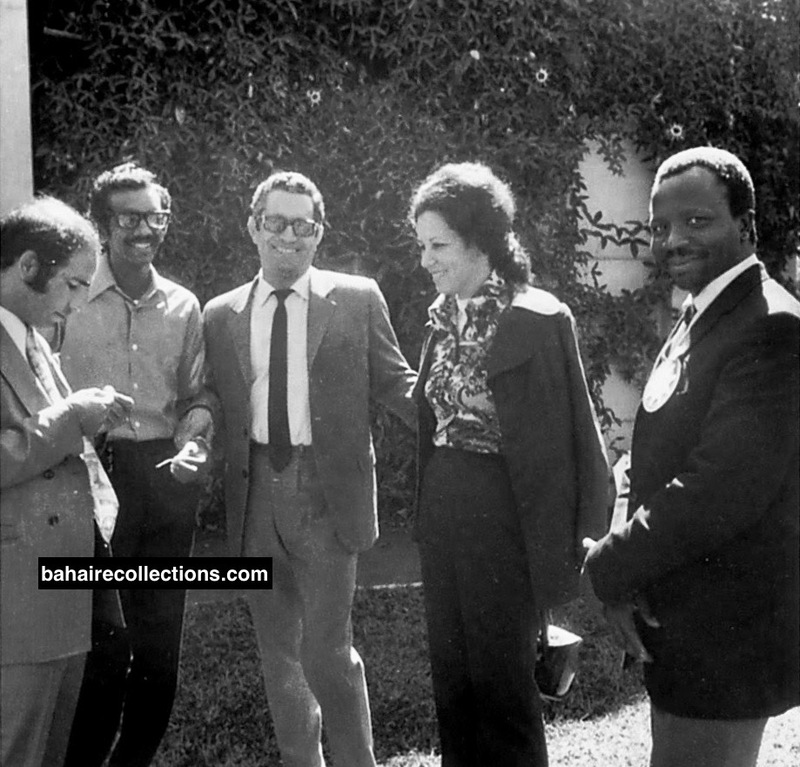 At extreme right is Naser Faffari. Squatting: Annamalai at left and Choo Yoke Boon at right. 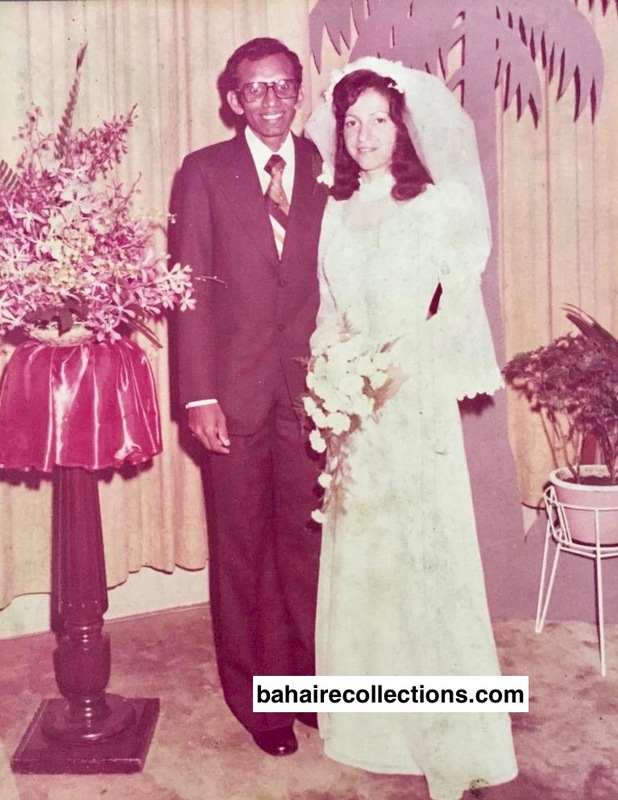 In June 1972, a new phase opened for Ravi when Hand of the Cause of God Dr. Muhajir flew into Malaysia and called for pioneers to selected countries in Africa to assist them in the unfinished goals of the Nine-Year Plan. Inbum Chinniah, S. Bhaskaran, N.S.S. Silan, T. Thanabalan, Kamachee and Ravi arose to pioneer Africa. Moved by the call to pioneer, Ravi resigned his prestigious job with the Guthries and sold his Mini Cooper. Then he went to his family in Ipoh to bid them goodbye. 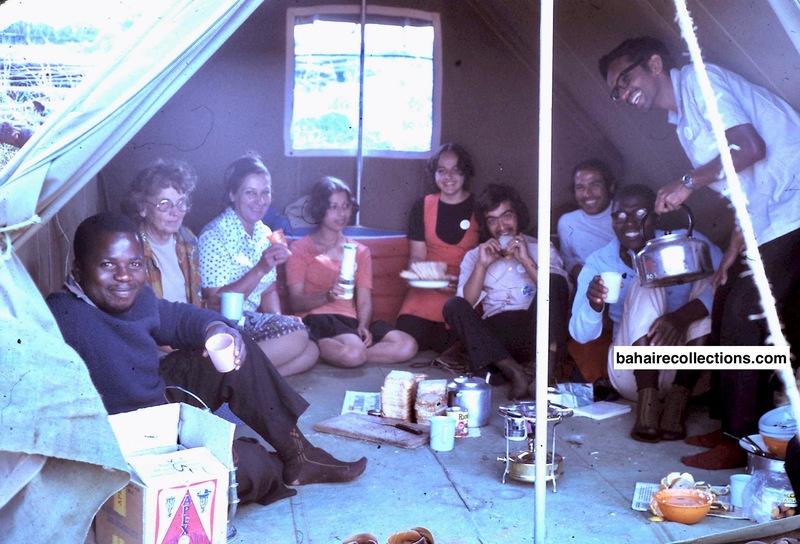 When Ravi accepted the Faith in 1967, he did not inform the family that he had become a Bahá’í. As he broke the news of his acceptance of the Bahá’í Faith, his resignation from his job, sale of his car and his decision to pioneer for Africa the family was shocked. But they respected his decision, as they were clear Ravi was not an ordinary adult. The mother especially had been praying for her son to grow up as a religious person. She was perplexed on what she called an unexpected twist that had befallen her son. Yet she believed that God was behind all her prayers and consoled herself that there has to be a hidden wisdom. All the six pioneers landed in Nairobi, Kenya in September 1972, to be informed of their destinations. Counselor Aziz Yazdi informed them of their respective destinations. Inbum Chinniah went to Tanzania; T. Thanabalan, Bhaskaran and Kamachee went to the Cameroons; Ravi went to Swaziland while N.S.S. Silan was assigned Kenya. Just a few weeks before Ravi arrived from Malaysia, a few other pioneers arrived from Iran in summer of 1972 to render service in Swaziland. They were Ehsan Masoudi, Dr. Ahmadi and Mrs. Lame’eh Ahmadi. Ravi served together with them and the local believers in organizing and participating in teaching activities. Ravi was visiting as many villages as he could. In Swaziland, Ravi moved with the local tribes as one of them, often choosing to dress in their traditional costumes, and eating their own food in their shelters. 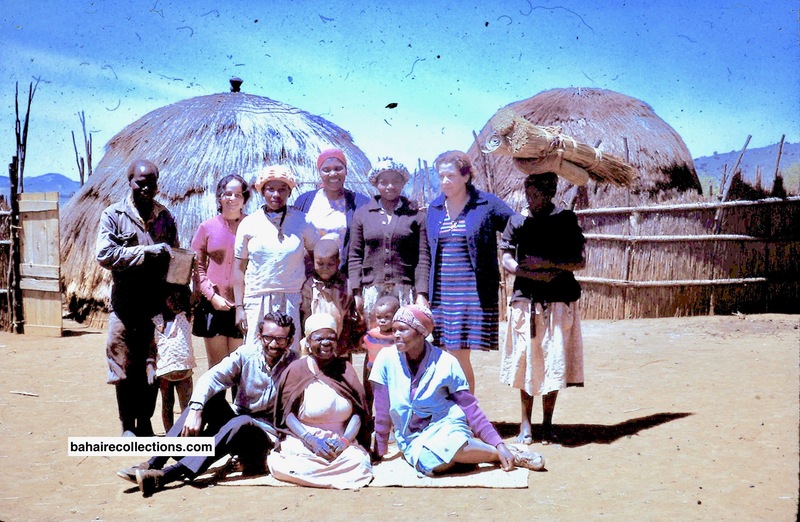 In September 1972, Amatu’l-Bahá Rúhíyyih Khánum, accompanied by Mrs. Ali Nakhjavani visited Swaziland. Ravi could not stand the Autumn cold and was shivering. He did not have or afford warm clothing as a pioneer. Amatu’l-Bahá observed the frail Ravi shivering and offered her own cardigan to him. 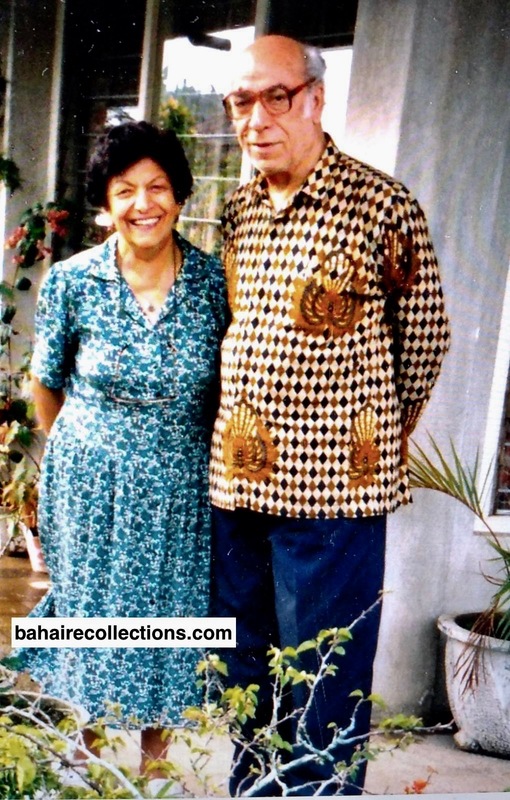 Ravi wore this next at the Second Bahai World Congress in New York in November 1992. This is today treasured and kept by his family in Malaysia. 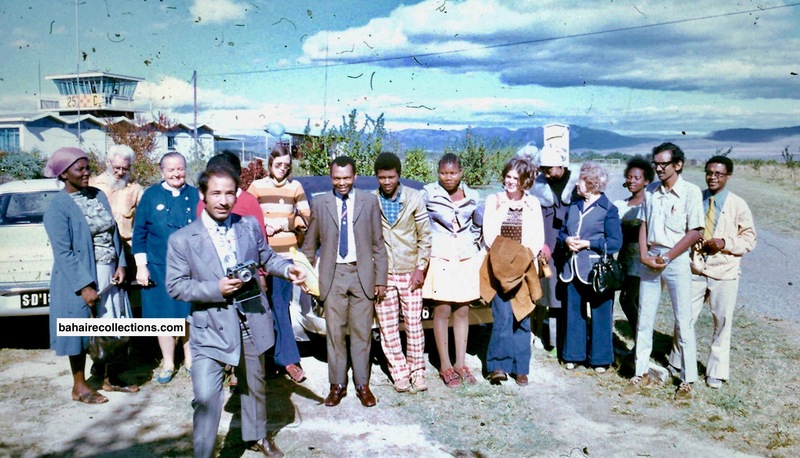 After some time Ravi got a job in Swaziland as an Engineer with some Waterworks Department with the Government of Swaziland, and stayed longer until 1975. 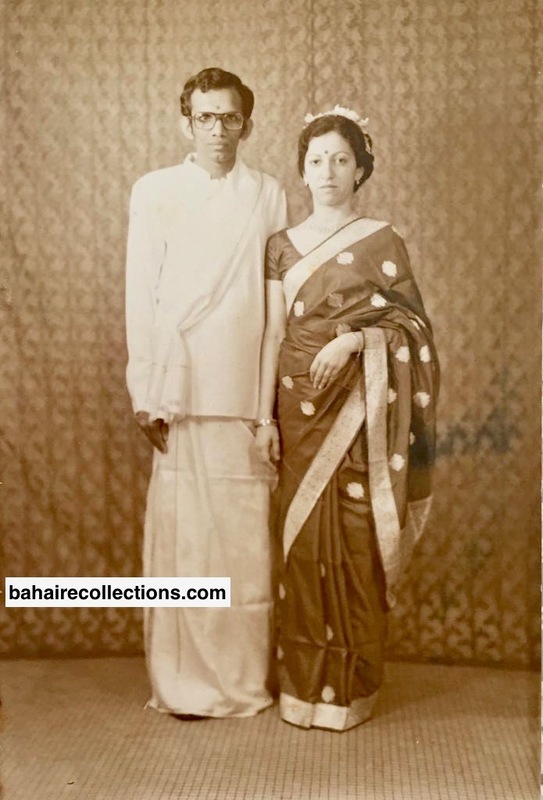 Meanwhile, upon completion of his six months in Cameroons S. Bhaskaran came back to Malaysia and returned to the Cameroons with his wife Sarojini and children. With that the Bhaskarans became the first to pioneer from Malaysia- as a family. 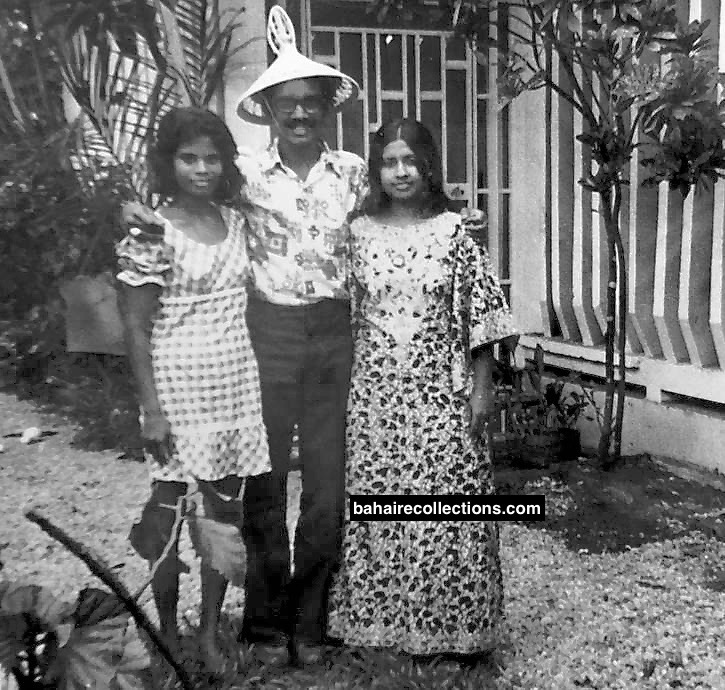 In 1974 Ravi visited S. Bhaskaran and his wife Sarojini in East Cameroons. Kamachee was also there during Ravi’s visit. To this day Ravi is still well remembered for his dedicated services there. While in Swaziland, Ravi never forgot his parents back in Malaysia. Each month Ravi sent money to his parents in Ipoh. He was acutely aware of his obligation to his parents and did not fail in that. While Ravi was in Swaziland yet one more development changed the entire fate of Ravi, this time it got written on the walls. Nargis too was coming to Africa, though was not planned at all. After her High School studies she pursued a three- year Diploma Course at the Institut Keguruan Ilmu Pengetahuan (Teachers Training Institute) in Bukit Tinggi, Sumatra, Indonesia majoring in English as the Second Language. 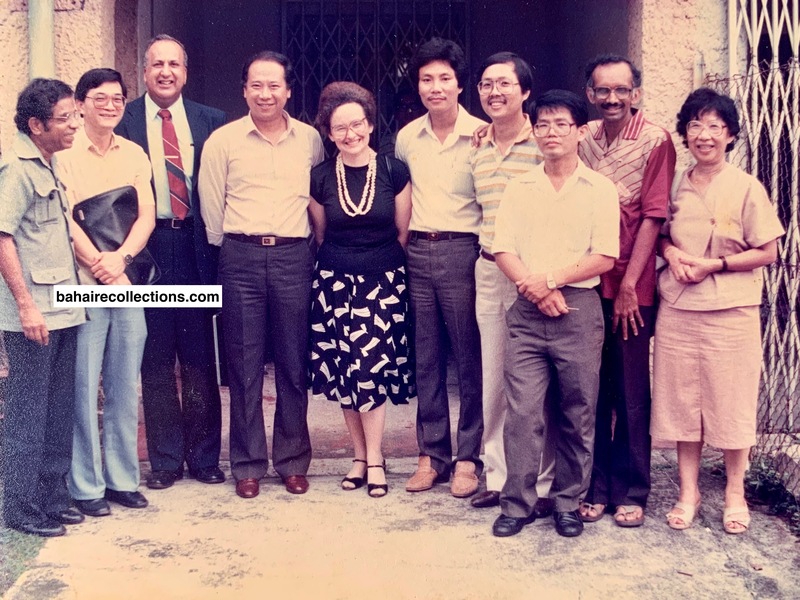 When Ravi was already in Africa, Nargis came to Kuala Lumpur in 1972 after her graduation from Indonesia, thinking that she could serve the Faith in Malaysia. That was the time when the Faith was banned in Indonesia. Her father Dr. Astani too thought that Malaysia will be a better place for her to serve the Cause since she knew the local Malay language which was close to the Indonesian Malay language. But divine intervention played its part. 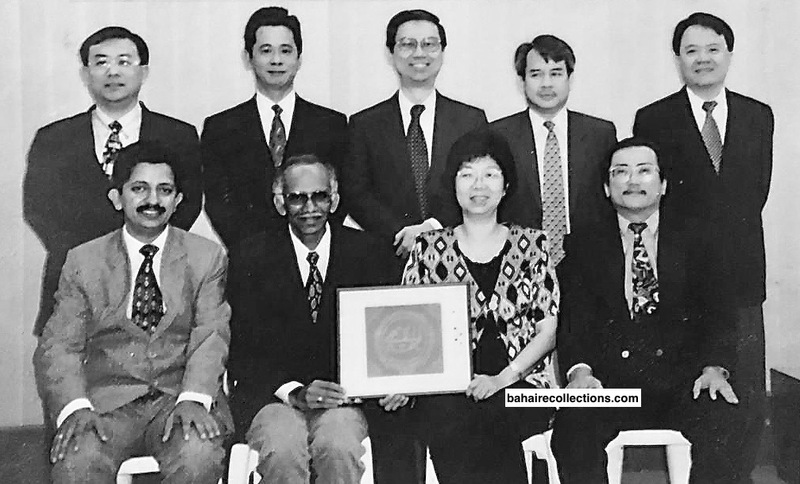 When Nargis consulted with the National Spiritual Assembly the Bahá’ís of Malaysia, the august institution requested Nargis to consider help fulfill the goal of Dr. Muhajir, which was to send 10 Bahá’í’s from various parts of the world to Africa. Nine had reached Africa, including six from Malaysia. Still the goal was short of one. Nargis called up her father in Indonesia to get his permission, and of course money as well. The Universal House of Justice was notified of this development. Decision was made and travel plans finalized. Nargis arrived in Nairobi on September 17, 1972. As she arrived in Nairobi there was a Teaching Conference where Dr. Muhajir gave very inspiring talk. The five other Malaysian pioneers had reported to their respective posts. Silan was still in Nairobi as Kenya was assigned to him. He and some pioneers from India, Iran and the Philippines were still in Nairobi participating in the Conference. While Silan was busy traveling around Kenya activating the Area Teaching Committees, conducting deepening classes and teaching the Faith, Nargis, Mr. Puthran from India and Mrs. Jalali from Iran were assigned to serve a town called Machakos which was three hours away from Nairobi. Her team will go out daily to the villages around to meet people outside their houses. On some other days they made appointment with the schools to talk to the students and teachers. While they were most of the time in Machakos, they also took the Faith to the Egerton College in Njoro and taught in the towns of Nakuru and Kericho. People were so receptive and embraced the Faith. At the end of 6 months teaching, a Local Spiritual Assembly was formed in Machakos. 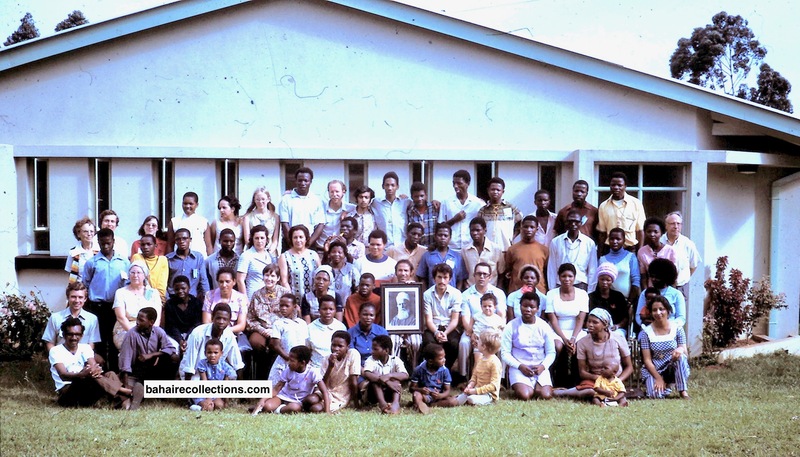 At the end of February 1973, when the teaching project was over they we went back to Nairobi. Nargis was waiting for her next area of service. Indonesia was not a welcome ground as the Faith was banned there. Amatu’l-Bahá asked her to go to the Netherlands which had at one time colonized Indonesia. It was suggested that Netherlands had an Indonesian school where she could teach. Nargis went to Amsterdam and met with the National Spiritual Assembly for guidance and advice. An appointment was made with the school and Nargis went there. The Principal got a big surprise to observe that Nargis could speak fluent Indonesian though she was not a native born of Indonesia. While the school was happy with her qualification, as a matter of policy they employed only Indonesians. Unfortunately Nargis was an Iranian national holding Iranian passport. With that position the school took, Nargis went back to Bukit Tinggi in West Sumatra, Indonesia where her parents were pioneering. She was in the Netherlands only for 10 days. But that was not the end. While still in Nairobi, a strong bond was developing between Ravi and Nargis. When Ravi was in Swaziland, he was sending a constant flow of letters to Nargis which she replied promptly. In stages the style in the letters became more personal. In his last letter Ravi asked Nargis if she would marry him. By this time Nargis was already having strong feelings for Ravi. She consented, but the deciding factor was still parental consent. From Indonesia Nargis was communicating with Ravi in Swaziland and waiting for Ravi to meet her parents upon return from his pioneering post. Ravi returned to Malaysia in 1975. From Malaysia Ravi made a trip to Bukit Tinggi in Indonesia to visit the parents of Nargis to get their consent. He spoke to the parents of Nargis. Dr. Astani was no ordinary believer. He was on the first Regional Spiritual Assembly of South East Asia that was elected during Ridvan 1957. He believed in going by the books. He asked if Ravi was serious. Ravi replied he was. Dr. Astani said giving his consent would not be problem. But he wanted the Local Spiritual Assembly of Ipoh where his parents were residing to verify the consent. Upon returning to Malaysia, Ravi was not seriously looking for a job. He was working harder to obtain parental consent to marry Nargis. It was not easy for him to get the consent from the orthodox Ceylonese parents. He introduced the subject to his parents with the greatest care. He started by saying he wanted to marry a Bahá’í girl, which was a shock to them, though not really unexpected. Then Ravi said the girl was from Indonesia, and this shook up his parents further. Then he said Nargis was a Persian residing in Indonesia. Each of these statements created shock waves in their hearts. The parents were not yielding that fast. The sad Ravi got the assistance of his brother-in-law to persuade his parents while Ravi was resorting prayers to rescue him from the whirlpool of uncertainty. At last, after a lot of persuasion and begging, his parents gave consent. But there was a condition attached to that consent. After marriage, Ravi was to go to the UK and complete his degree in Mechanical Engineering. Ravi accepted the condition and came over to Kuala Lumpur to make the arrangements. Ravi announced his marriage at a Nineteen Day Feast at Kuala Lumpur where I was also present. Ravi announced with a radiant face and a broad smile, “Dear friends, my long-awaited day has finally come. Please come for my wedding.” A. P. Arumugam asked him to repeat what he had just said, and Inbum interjected to reply on Ravi’s behalf, “Ravi just announced that the time has come for him to start talking philosophy of life.” They married on Saturday, 26 July 1975 at the Merlin Hotel (Concorde Hotel today) in Kuala Lumpur. Inbum Chinniah the beloved of Ravi’s heart was the Master of Ceremony. A.P Arumugam was the representative of the Local Spiritual Assembly while Lily Chinniah and Joan Featherstone were ere the two witnesses who signed on the marriage certificate. 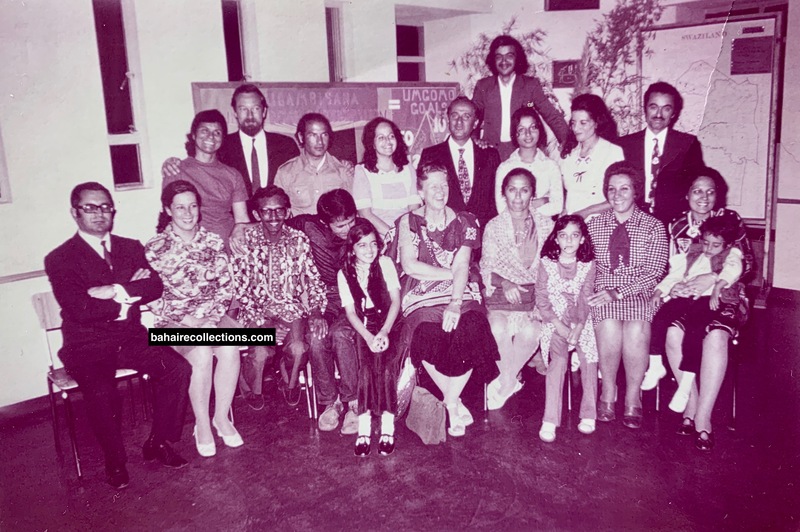 It needs to be mentioned that Nasrin, sister of Nargis married Benedict Chee, grandson of the first believer of Malaya on Sunday, 22 August 1982 in Ipoh town in the state of Perak. After their marriage, the couple lived in Kuala Lumpur for a short while. Ravi and Nargis then left to the UK. While Ravi was working in Swaziland, he had saved some money with which he was able to study and sustain himself in the trip to the UK. He studied Mechanical Engineering at the Paisely College of Technology, and in the last six months was doing his practical training in Nottingham. While at Nottingham, Ravi and Nargis actively involved in the teaching activities and other community activities. 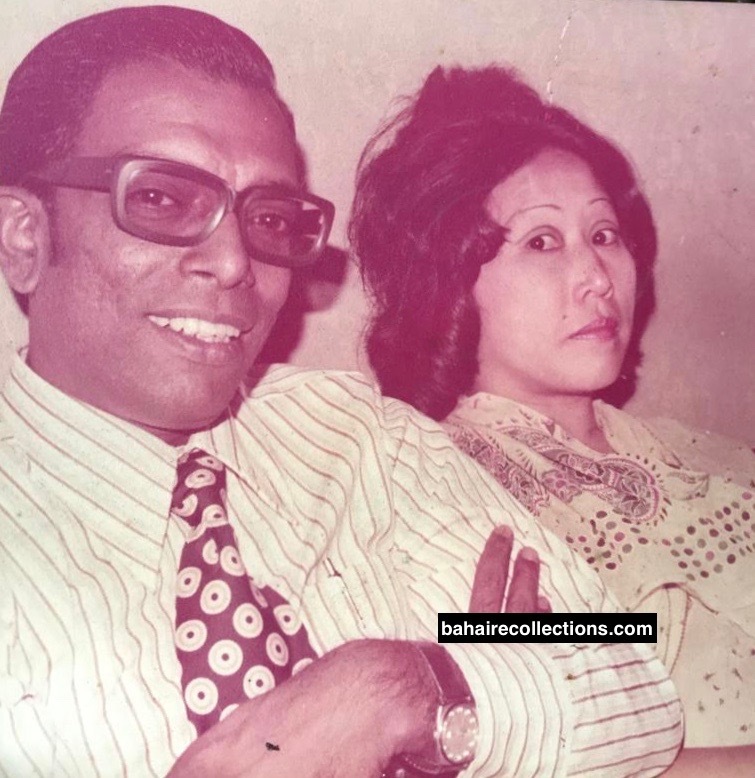 Having obtained his Degree in Mechanical Engineering in the UK, Ravi returned to Malaysia with Nargis in August 1977. They first came to stay with Inbum’s family for about a month. Ravi was unemployed at this time. Nargis was expecting their first baby. Nargis had to go back to Indonesia to have her baby delivered. Nosrat, their eldest daughter was born in Indonesia in December 1977. But Ravi stayed back in Kuala Lumpur to look for a job. Here was his wife who had just delivered, and he was still unemployed. Then he got news that Span Engineering was looking for a Mechanical Engineer. He applied and got the job. Span Engineering was managed by a great believer by name of Mr. Errol Seow, who had helped several believers in manifold ways – mostly without publicity. In February1978, Ravi started working for Span Engineering. He worked till May 1986. The name of the company was then changed to Mensec Engineering under the Kwok Brothers. Ravi worked with this company till he retired in January 2006. All his colleagues knew about the Faith well. He was always teaching not only by words but by deeds as well. He was exemplary at work. His colleagues and subordinates knew Ravi as a person of spotless character, did not drink alcohol or smoke. He was also known for never getting involved in any kind of gossip. And whenever he went on work trips to Japan, Sri Lanka, Indonesia, Fiji, India, he would always contact the local Bahá’ís and joined their Feasts and other activities. Ravi deservedly moved up the company ranks and was never boastful about it. He was given a choice of selecting a good continental car in his position as an Engineer, but instead he picked a car that could ferry as many passengers as possible, keeping the Faith in mind. He had a Mitsubishi Pajero that had a bench type seating in the rear. This was used to transport countless youths and children to children’s classes and youth gatherings or any other Bahá’í activities where transport was required. In one instance Ravi crammed 15 people into the Pajero, with some sitting on the floor. Later, he was given a choice to upgrade his vehicle. But Ravi went for a Toyota Estima instead of a BMW or Mercedes Benz. The vehicle he chose became a servant to numerous servants of the Faith carrying them for several Bahá’í activities for many years. Upon settling down with a good job now, Ravi was once again very active in the Faith. In 1978, Ravi based himself in Petaling Jaya and served on the Local Spiritual Assembly for a number of years. I had the opportunity to serve with him on the Local Spiritual Assembly of Petaling Jaya for some years. Ravi was truly an embodiment of humility that the members used to tease him “Saint Ravi” or “Reverend Ravi” at Assembly meetings. 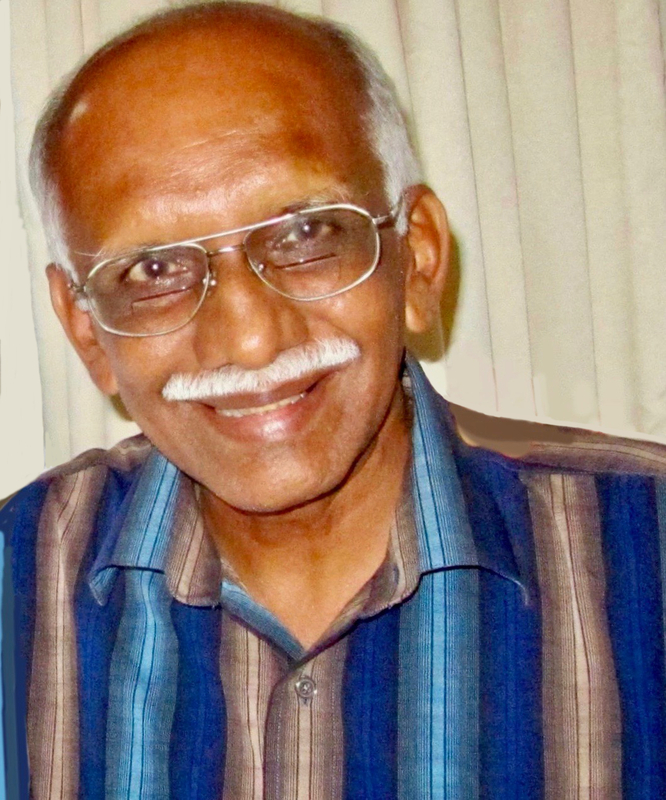 Ravi was actively serving on the National Teaching Committee in the mid 1980s. Even at its meetings he never for once argued on any matter, but only put forth his arguments in accordance with the principles of consultation provided for in the Writings. He mastered the art of consultation and was a good communicator at Bahá’í gatherings. In all the committees Ravi served he developed a harmonious working relationship with the members. In 1983 the Supreme Body appointed the International Chinese Teaching Committee which was replaced by the Bahá’í Committee for China in 1993. 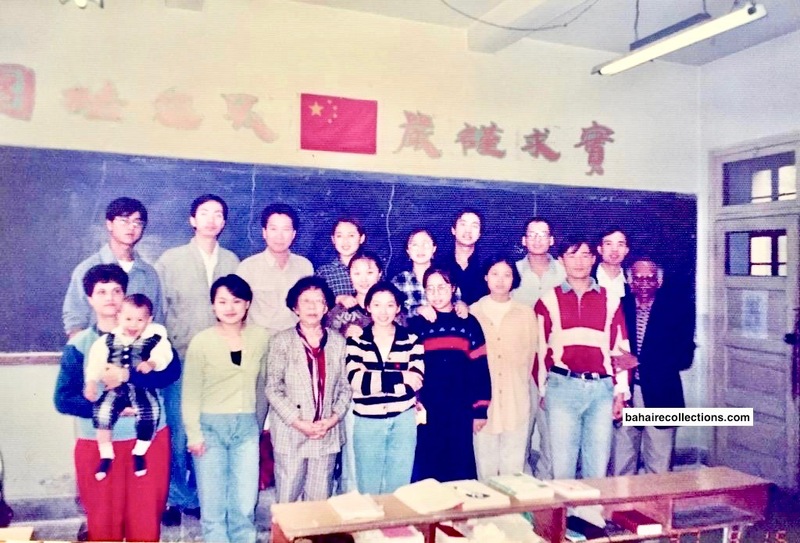 Those who had served on the International Chinese Teaching Committee during this period of 12 years were T. K. Lee, Yin Hong Shuen, Mei Siew Hong, James Liew Ben Poh, Soh Aik Leng, Steven Chang Sin, Paul Koh, Charles Paul (Singapore) and Ravi. History would have it that Ravi was the only non-Chinese to serve on this Committee. On 12 November 1986, the family moved to Subang Jaya where Ravi served in various capacities till his last breath. 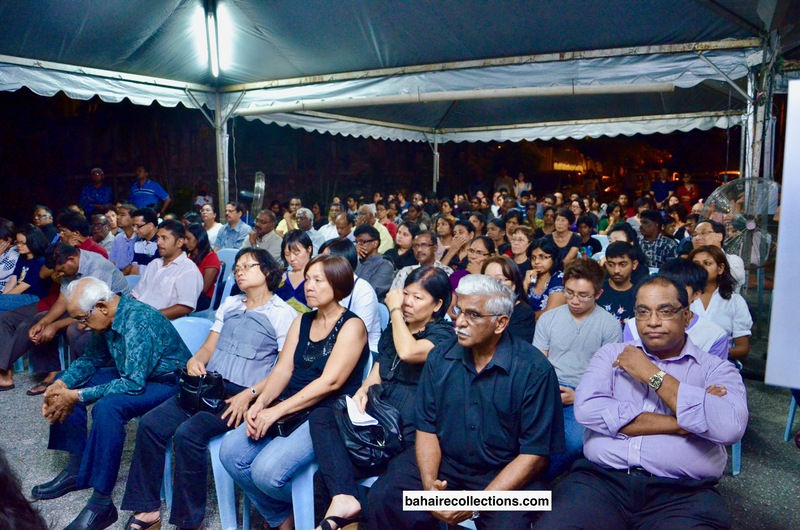 In Subang Jaya, he was one of the strongest supporters of the community activities. He was elected to the first Local Spiritual Assembly of Subang Jaya in 1997 and served as its Chairman for several years. Ravi was there for all activities, however tired and gaunt he was. Ravi also gave all encouragement for his wife and children to be in the forefront of activities. Ravi made sure he and his family members always had something to do for the Cause. He was fully immersed in Bahá’í activities. When there was no Bahá’í activities, he would still find a way of creating an activity. When there were no activities or meetings during the weekends, Ravi would undertake visits to other communities such as Jenjarom to visit Mr. Paul Koh and speak to the neighbors in Kampung Cempaka, Kuala Selangor and Klang. When he could not go outstation he would speak to his neighbors. Home visits was part of his way of life even before the term “home visits” was coined. On the few family holidays that Ravi planned, he always tried to find out if there were any Bahá’ís in those places and contacted them in advance. Upon reaching the holiday destination he would pay them a visit. Ravi’s passion to teach the Faith in foreign countries did not cease. While in Subang Jaya that Ravi travelled to Cambodia, Thailand and China for teaching activities. Effective 1993, Ravi undertook some teaching trips to Cambodia and was in the company of S. Satanam in the teaching field. He was involved in Ruhi classes and other specific classes requested by the National Spiritual Assembly of Cambodia. The local friends remember Ravi as a great source of encouragement, love, and unity among the friends. In 2002, Ravi followed Counselor Rose Ong of Singapore to teach in some universities in China. Ravi’s face beamed with tremendous happiness . The Chinese students were excited to see Ravi and they called him, “Indian Rose” as reported by Counselor Rose Ong. As and when opportunity permitted, he would make visits to Indonesia to visit his in laws and the friends there. Ravi passionately participated in many conferences, summer schools and other gatherings held locally and abroad. Ravi was interested in service alone and not in holding any special place or position. When Ravi was first approached to be a Board Member, he turned down the offer, citing reasons that he was not spiritual enough to hold such a post. But it was years later that he accepted to be a Board Member on account of specific works to be accomplished for the Cause for which the post of Board Member was indispensable. Ravi was Board Member for Protection for the Central Region from 2003 to 2005. Ravi never took the task of Board Member as a rank, station, or position in the Faith. He felt uncomfortable whenever he was introduced as “Beloved Board Member,” remembering what Inbum had taught him. Inbum had advised Bahá’ís several times, that positions come and go, but ultimately it is the service that would remain forever. Ravi was acutely aware that grip attachment to the kingdom of names and fame were perfect recipe that would gravitate to his spiritual decay. When the Ruhi classes were introduced in Malaysia Ravi was one of its strongest supporters. If Ravi was the tutor, one would have studied the book thoroughly as he would never rush and finish the book for the sake of it. He traveled extensively to support the Institute process. Ravi took extensive teaching trips to Tanah Merah and Pasir Mas in the state of Kelantan and the towns of Raub and Mentakab in the state of Pahang. As a Board Member for the Central Region Ravi had to travel widely in the states of Selangor, Negeri Sembilan and Pahang. Concurrent with this responsibility Ravi was also appointed as a National Coordinator for the Institute Processes, and that called for greater burden upon him. After giving careful considerations, in 2005 Ravi asked Counselor Dr. Loh Lee Lee to relieve him from his duties as a Board member to concentrate on the more pertinent Institute Development Board which he served diligently from 2005 till his passing in 2012. As a National Institute Development Coordinator, Ravi visited the Asli villages in South Perak, if need be, every week. In his visits he met with the Study Circle Cluster Coordinators who serve in the Asli areas and train them on how to keep good reports, developing love for the Asli people. At times Ravi was accompanied by his eldest daughter Nosrat. In one such visit in 2008 Ravi and Nosrat stayed for a night in Kampung Sungai Jentong, Perak. Ravi balanced his obligations to the Faith and his family only too well. Ravi’s care for his sisters continued after his marriage. Two among the three sisters were married. On each Deepavali day – the Hindu Festival of Lights, he would visit them with his own family. 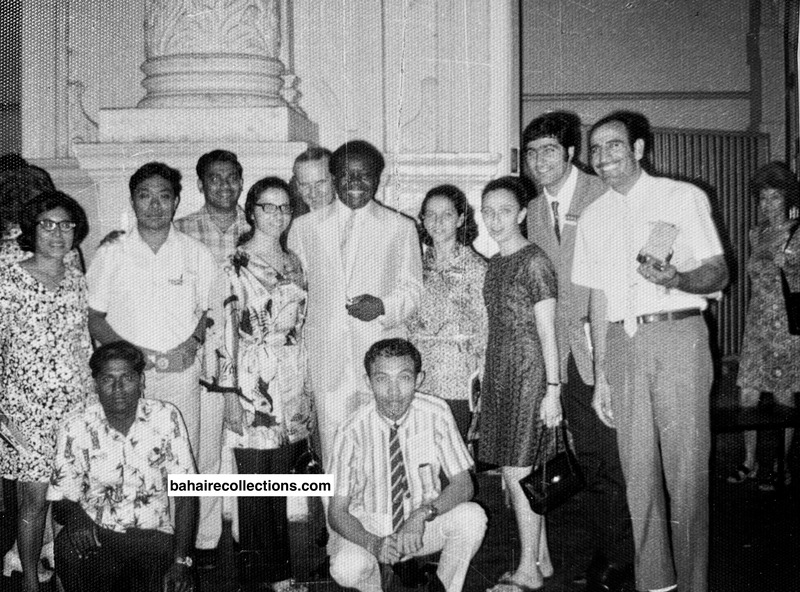 In his trips to visit his family in Ipoh, Ravi never failed to detour on those trips to meet some Bahá’í friends. He would stop in Bidor to visit Rama Naidu, in Kampar to visit Leong Ho Chiew, in Tanjung Malim to visit Narasiah – when all these believers were still there. After visiting his family in Ipoh, he would visit Mrs. Theresa Chee and her father Yankee Leong. However Ravi seemed to have paid more attention to visiting believers in deep difficulties or with ailing conditions. One of those he visited was Kit Yin Khiang, the first Malaysian pioneer to Taiwan who had returned and suffered of stroke, and staying at the Leong Tat Chee Institute in Malacca. While Ravi himself prayed he had requested his family members to also pray for him. How sad, Kit Yin Khiang passed just one day after the passing of Ravi himself! When Ravi showed concern, he was very sincere about it. 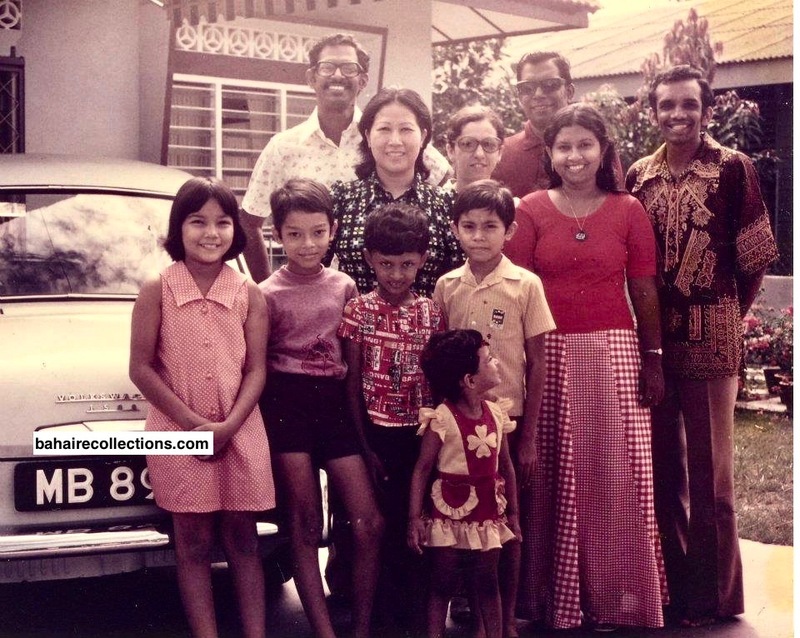 From the time Ravi married Nargis, he devoted equal attention to his own family in Ipoh and his in laws in Indonesia. Ravi and Nargis took their children to visit the family of the in laws from time to time and over a period of time Ravi became a close friend of several other believers in Indonesia. 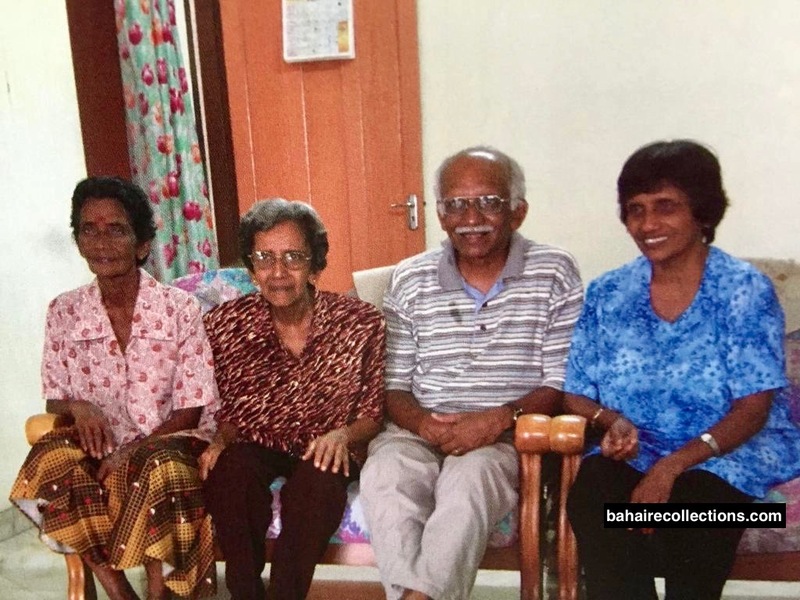 When Ravi’s two married sisters moved to Kuala Lumpur, Ravi brought his unmarried sister to Subang Jaya to look after her, as she had developed Parkinson disease. In order to have full time care for the ailing sister, the family decided she would stay in a nursing home and Ravi would regularly visit her, making friends with all the patients and the therapist and caregivers. He continued to care for her until his last days. The last few days of Ravi’s earthly life was full of stress on account of the number of work he had to accomplish for the Cause. Constant concern and anxiety to get tasks assigned to him sapped his energy. Ravi took the task of conducting Ruhi classes very close to his heart. 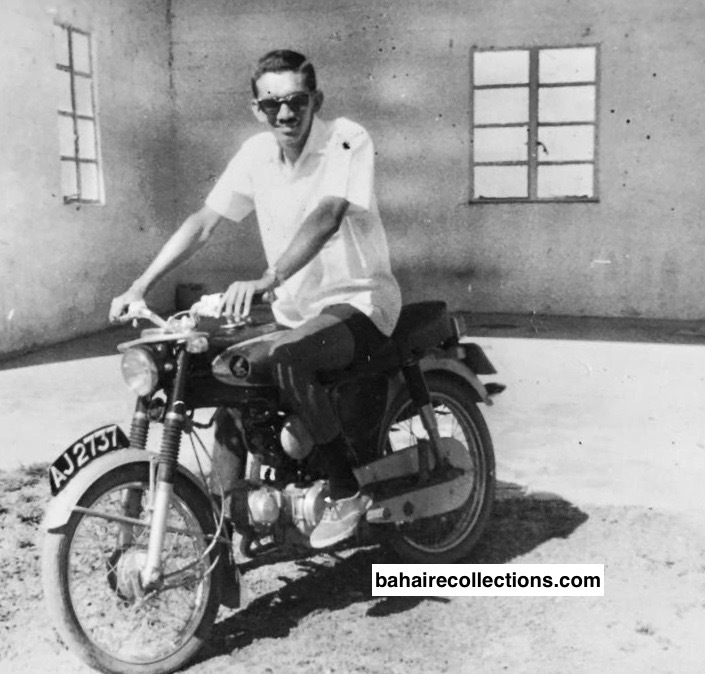 He used to drive to Raub town in the state of Pahang to conduct Ruhi classes. But of late, he was so exhausted that he would take the public bus to Raub, conducted the classes, and passed the night with little comfort and with no complaints. After completing his last trip to Raub, Ravi arrived in Kuala Lumpur by bus on Friday, 8 June 2012 very exhausted, and Nargis drove to the bus station to bring him back. That night he looked extremely tired and went to bed. The following day, Saturday June 9, 2012 was the memorial service for Mrs. Kasturi Ratnam who had passed away a few days ago. Nargis had to go in another car, while Ravi’s friend T. Thanabalan drove Ravi to the house of Dr. Ratnam. Thanabalan noticed Ravi looked worn out. While all else had their dinner at Dr. Ratnam’s residence, Ravi had not. In all such social gatherings Ravi would help himself. Nargis asked if Ravi wanted dinner and Ravi asked for a small portion. Ravi did not consume even the little amount of food on his plate. He was unusually quiet and confined to a corner. He definitely looked sickly. From a distance his close friends observed Ravi sitting alone, keeping much to himself. Mr. Theenathayalu, another close friend of Ravi approached him and asked him to visit a doctor at the earliest. That night Ravi returned home and had some tea prepared by Nargis. Nargis went to bed, while Ravi was reading some Bahá’í Writings in his iPad. Ravi had the urge to go to hospital and yet did not want to disturb or alarm Nargis. Ravi then retired to bed. In the morning of Sunday, 10 June 2012, Nargis informed their daughter Neda that her father was not feeling well. Neda went to see him in his bedroom and he was sitting on the edge of the bed. He told Neda that he was having chest pains and that he wanted to go to hospital. He specifically mentioned that he wanted to go to University Hospital in Petaling. Jaya as they had his records there. Neda and Nargis then quickly got ready to go. Ravi was wearing a collar T-shirt and sarong, and when Neda asked him to change his sarong Ravi quietly said no. Neda felt something unusual. Nargis observed that Ravi’s T-shirt was drenched with his sweat. Ravi went downstairs on his own and sat down on the couch, and asked Neda for some water and a sweet. Before leaving the house, Ravi put a small book of the compilation of Ruhi quotes in his shirt pocket. He sat in the front seat of the car, while Nargis sat at the back. Neda drove the car to the University Hospital. As the car started to move, Ravi reminded Nargis of the Ruhi class that he was to tutor that evening, but Nargis told him to attend to his health first. On the way Neda was asking Ravi how he had been feeling, but he did not converse much. At one point on the federal highway, Ravi started gasping and Neda grabbed his hand and called out to him. Nargis also held him from the back seat and, together with Neda started chanting with vigor the Remover of Difficulties prayer in Arabic. Ravi continued to hold on to the left hand of Neda. Neda pressed on the accelerator and sped as fast as she could, defying red signal lights, and all the while holding Ravi’s hand. He was rushed directly to the Emergency Room. Nargis and Neda were waiting outside and praying hard with tearful eyes. The doctor came out with a sad face and informed that they had performed CPR, tried their best to resuscitate him, but Ravi had passed away from heart attack. His book of Ruhi quotes, his pendant of the Greatest Name and Bahá’í ring were on him. He had returned to his beloved in a peaceful and painless way. Neda had the toughest and painful job of calling her siblings who were all away at that time to break that heart rending news to them. Nosrat was in Australia doing her Masters, Roya in China as a student pioneer and Roshan just outside of Kuala Lumpur. Just weeks ago Ravi was excitedly waiting for the arrival of his first grandchild and had many plans to celebrate. That grandchild Renyi, son of Roshan was born on Saturday, 28 July 2012. Some of Ravi’s close friends were so emotionally moved that they refused to speak. Following the funeral service on Tuesday, 12 June 2012 at Ravi’s residence in Subang Jaya his cortege left for his final burial service at the Seremban Memorial Park. Thus came to an end the life of this lovable believer. Several Bahá’í friends from Malaysia and abroad sent messages of condolences to the family of Ravi. Condolence messages poured in from the United Kingdom, Australia, China, Indonesia. Singapore, and Borneo. The community of Freetown in Sierra Leone, Africa expressed its sadness and informed that they had dedicated their expansion phase in the name of Ravi. Ravi’s spiritual mentor Inbum used to say that to be a Bahá’í is to serve in the Faith until one collapses. And this happened to both Inbum and Ravi. Ravi’s mother had prayed for her son to grow up as a spiritual person, and her prayers were well answered in full. Ravi had left behind an indelible trace of great services for the Cause. And to a large extent he had set a very high level of exemplary life in every sense. Ravi was basically a shy person but never failed to rise to occasions whenever faced challenges. Throughout his life, all his energy and thoughts were focused on one thing, and only one thing-to tirelessly serve the Cause and bring victories for the Cause of Bahá’u’lláh, which he loved wholly and wholeheartedly. He was simply obsessed with the thoughts of teaching the Faith, as the beloved Guardian urges, and made the Cause the centre of His life. Unquestioned obedience to the call of the institutions simply became second nature to Ravi. He never criticized the institutions. He would be frank at consultation sessions, but not outside this platform. Ravi lead a very simple life throughout his days. He almost never shopped for himself. Sometimes wearing the same slippers till it was worn out or using the same frame for his glasses until the frame turned green were not a concern for him. He never complained about any meal cooked for him. He never was interested in the so called branded shirts the materialists would boast off. His favorite was always simple T- shirts. Ravi was an avid reader. Ravi’s Bahá’í books were full of notes. Ravi would treat each message from the Supreme Body with so much reverence. He would read them several times, and even got the family together to read and discuss the contents. He had boxes upon boxes of Bahá’í material and almost all of them had his hand written notes or points. His Ruhi books were full of notes from the numerous groups he tutored. Ravi always felt the urgency of the time, and that there was so much to do with the limited time he had at his disposal. Ravi did not believe in simply spending money in holidays with no results forthcoming from them. His priority was always serving the Faith so much so he did not encourage his children to take part-time jobs during semester breaks, when it was the norm among their peers. Instead, Ravi sent them for Army of Light Teaching Campaigns, youth camps and other teaching trips. He said they will have a whole lifetime to work later on, and it was better for them to use the holidays to serve the Faith. Spending time in the Yankee Leong Bahá’í Institute in Balakong was the right kind of holidays for his children. Even on family trips to foreign countries he would find a way of tying the trip with Bahá’í activities. On one trip to the UK for the wedding of his niece, Ravi, together with Neda and Roya made a short visit to Paris by bus. Before the trip, he contacted the National Spiritual Assembly of France and with their help managed to arrange visits to `Abdu’l-Bahá’s apartment, where He delivered the famous Paris Talks. He also arranged a trip to the cemetery where there were a couple of Bahá’í figures including Thomas Breakwall. And he organized trips to a couple of Bahá’í gatherings, even though everything was in French. It was the Bahá’í spirit that mattered to him. On the handful occasions that the family did go sight-seeing, Ravi somehow would always just naturally strike up conversations with strangers and eventually start teaching the Faith. They seemed to always listen to him. He was just one of those people who had a friendly warmth about him. Ravi was very passionate and obsessed with the urgency of teaching the Faith. Whenever the family went out for meals, he would make friends with the waiters. He was a true lover of humanity. Within the neighborhood, Ravi took extra effort to become acquainted with the security guards. With one of his regular mechanic guys, Ravi even made him like his own son, visiting his family in Perak during Deepavali day and introducing him to Ruhi classes. It is not surprising that when that mechanic learnt of the passing of Ravi, he was there to help the family and became one of the pall bearers. He would never miss to attend the Feasts or Holy Days no matter where he was. Even when on holiday, he would make sure that we did not miss them. He placed such strong emphasis on attending the Feast that even when exams were the next day, it was not an excuse to miss the Feast. It must be mentioned that Nargis was his strongest companion and shield for Ravi, that enabled him to serve so effectively. Ravi gave the best education to his children. Ravi and Nargis sacrificed and endeavored to bring up their children in the best Bahá’í way. Ravi created a very loving atmosphere at home. He tried his level best to have family prayers daily in the evenings. And every prayer session would end with a discussion on one or two passages from the Holy Writings. In most matters Ravi would say to his family, “Let’s see what the Writings says about this.” Even on their road trips Ravi always brought his cassettes of Baha’i talks and would play it for all to listen. He always told his family to put the Faith as the centre of their lives. When Neda was trying to decide to leave her job as a lecturer in the Sunway University and go to Africa as a volunteer with no pay, Ravi’s advice was, “Just put your trust in Bahá’u’lláh, and as long as put the Faith first, He will take care of you.” And she left for Zambia for almost two years effective July 2008, and that turned out to be one of the best times of her life in service. Ravi’s respect and reverence for elders finds no parallel. Whenever he was in the presence of elders in the Faith, he showed so much love and respect for them. He would invariably approach them in with all humility and even with arms folded. 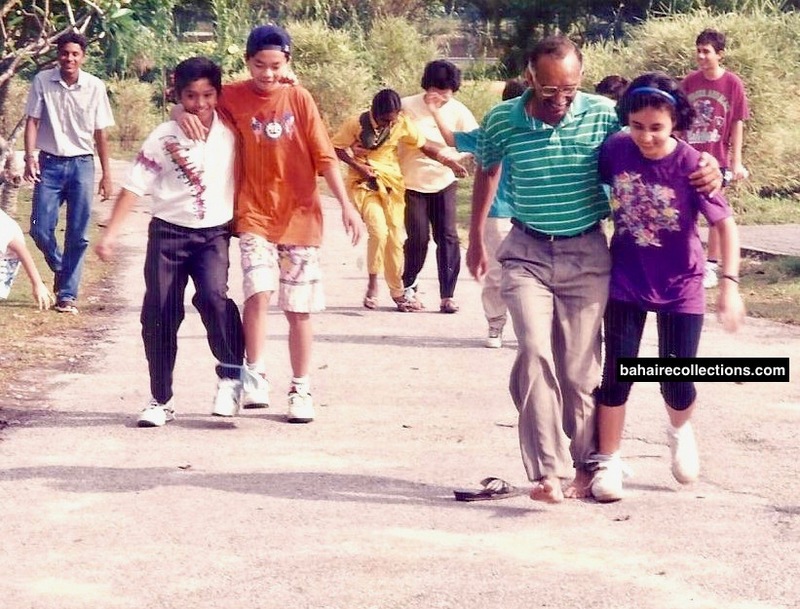 Whenever he travelled to other parts of Malaysia, he used to visit those elderly Bahá’ís in other homes, who had become immobile owing to their ailing conditions. He always had a special feeling for those who come from humble beginnings. He could always be seen with the Asli believers, as well as the believers from the estate community, with whom he conversed in his typical Ceylonese Tamil. One of the things he loved very much in his life was humor, and he always sought the company of Bahá’ís who were able to cheer the crowd. Ravi was not a person who would crack jokes, but he would look out for believers who would make him laugh. Ravi would smile even before the joke comes out. At the slightest joke Ravi would laugh his lungs out and his presence would be immediately felt. It would again be no exaggeration to say that in every gathering Ravi would pass out as the humblest person. Ravi never said never whenever approached for any Bahá’í work, however difficult it may be. He participated in almost all teaching campaigns held in other parts of the country. He simply loved the company of Bahá’ís. 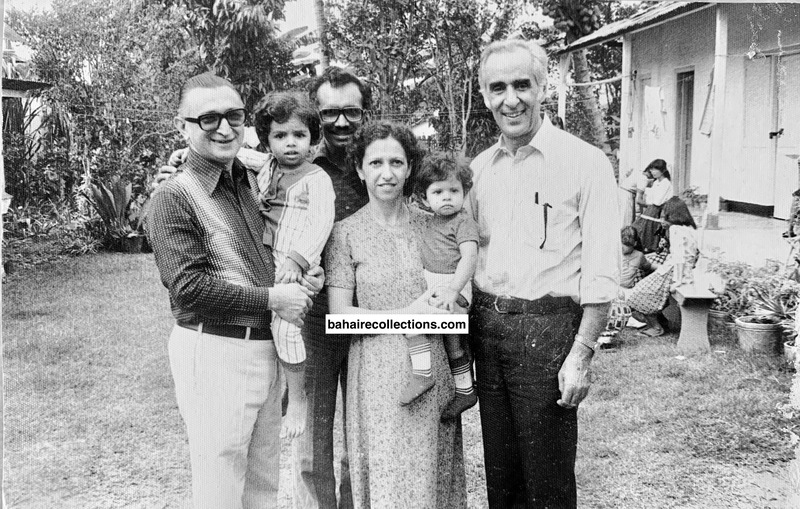 Ravi had the rare talent of mixing equally well with Bahá’ís of all ages and was a popular uncle among youths. 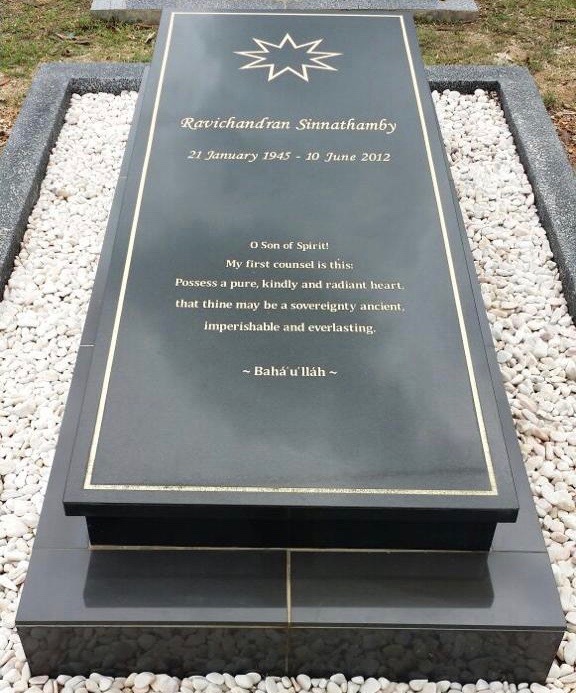 No words could adequately describe Ravi’s love and faith in Bahá’u’lláh. There is no part of the country he had not visited in all his years as a Bahá’í, and he is one of those who is well known by each and every believer in Malaysia. His soul was so spotless that he could not see any evil in any person. Whenever he found disagreement with people on Bahá’í matters, he consoled himself by the promise in the Writings that wrongs would be made right, over passage of time. Even in his advice, he would often quote the Writings rather than imposing his own ways. In counseling others, his words too were as mild as milk. He lived a simple life- as an example to the rich and a consolation to the poor. In all his manifold of areas of Bahá’í service undertaken with so much love, he has left indelible traces. Both his heart and house were always opened for Bahá’ís and non-Bahá’ís alike and was fondly loved by Bahá’ís and well respected in his work place for his high ideals in life. Ravi’s is a life of constant and continuous service that never wavered for a moment from the year 1968 when he embraced the Faith. Ravi not only lived a true Bahá’í life but was exemplary for many of us to emulate the path he had trodden on this earthly plane. Ravi’s complete devotion for the Cause, his utter humility, utmost sincerity, and radiant disposition will forever be remembered by those who associated with him. There seem to be an exemplary manifestation of nothingness about him. Ravi was a soul enthused in service, and service alone. His irreplaceable loss shall be felt by all those who had known him. Here is a well-lived life that shall be remembered for generations to come. We thank Bahá’u’lláh for creating in our midst, and during our lifetime, this star servant who shall live forever in our memory. Ravi’s mother wanted Ravi to grow up as a spiritual person, and here was the answer from God in making him a believer and nurturing him into a pious believer. The believers who had known Ravi in Malaysia and abroad would have every reason to be proud of him who has been immortalized in our rich history. 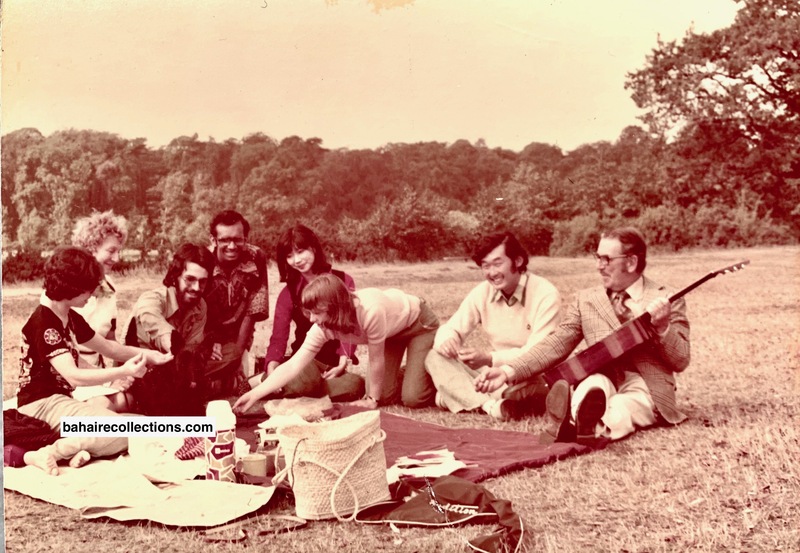 The author would like to thank the family of Ravi and some individual friends who came forward to generously share some of the photos that appear in the story.